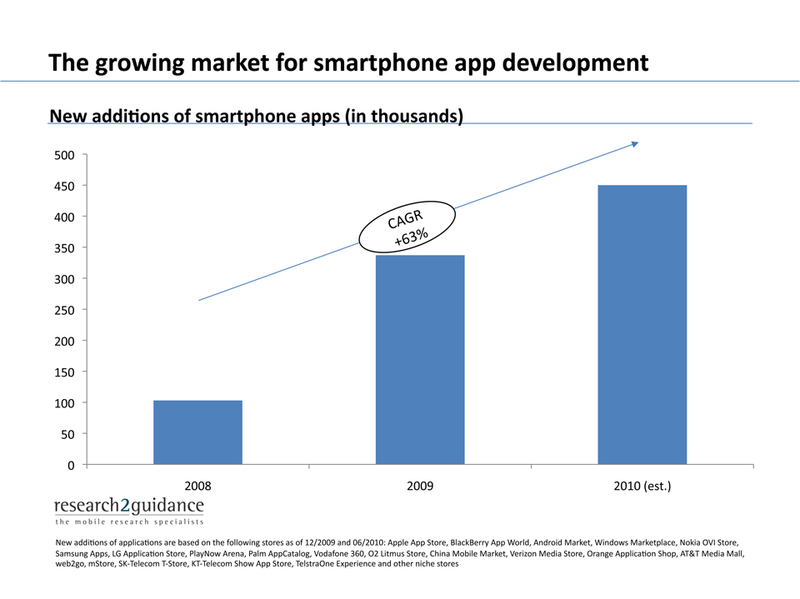 ﻿research2guidance - In 2010 around 450,000 smartphone apps have been published guiding the app development market to become a multi-billion dollar market. In 2010 around 450,000 smartphone apps have been published guiding the app development market to become a multi-billion dollar market. In 2010 around 450k applications were newly published to the main app stores worldwide. Over the last three years the number of new additions increased by 63% per year. The development of mobile applications has become a multi-billion Dollar market. Although the IT service market is normally well covered by many analysts, the smartphone application development market is not yet analysed in detail. What are the main drivers and barriers? How to become a successful player in this market? Is the mobile application development business profitable (in the short and long term) or are we looking at the next bubble? How are app developing companies organized? Are they engaged in mostly large or small projects? In which country do they do business? Are their clients from the local market or from abroad? Are major IT firms participating in this market? If not, are they planning to? The aim is to publish a business guide which will be available from march 2011, and will successfully provide app development services for all companies active or wishing to become active, in this field. If you are an app developer you can become part of this new venture by participating in our online survey. The survey’s results will help you to optimize your business and to understand one of the newest and most dynamic markets in the world. It only takes 10 minutes and every participant will receive the results for free. Please share your thoughts and feelings about the service side of the smartphone app market.